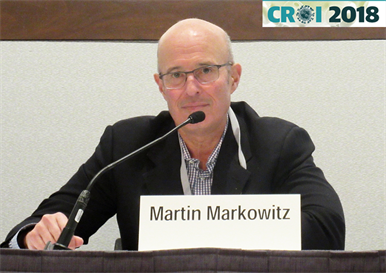 Martin Markowitz at CROI 2018. Photo by Liz Highleyman. MK-8591 or EFdA is a novel and exceptionally long-lasting and potent HIV drug, being developed by Merck. It is a nucleoside reverse transcriptase translocation inhibitor (NRTTI). Its potency and longevity are due to the fact that it acts at two stages of the HIV lifecycle: as well as blocking HIV from making a DNA copy of its genes that can be inserted into a human cell, it also blocks integrated HIV DNA inside cells from being turned back into viruses. At last year’s Conference on Retroviruses and Opportunistic Infections (CROI), studies showed that a single dose of MK-8591 of as little as 0.5mg produced HIV viral load drops of at least tenfold in HIV-positive human volunteers (For comparison the daily dose of rilpivirine, one of the most potent current HIV drugs, is 25mg.) In another study, when used as pre-exposure prophyalxis (PrEP), a weekly dose of 4.3 milligrams per kilogram (mg/kg) fully protected a group of eight rhesus macaque monkeys from infection. The drug levels seen in the monkeys in last year's study were sufficiently high for the researchers to wonder if a lower dose would also work. The eight rhesus macaques that had received MK-8591 in that study were therefore given six weekly doses of one-third the original amount of drug (1.3 mg/kg) and challenged four times with SHIV. None were infected. Markowitz M et al. Low dose MK-8591 protects rhesus macaques against rectal SHIV infection. 25th Conference on Retroviruses and Opportunistic Infections (CROI 2018), Boston, abstract 89LB, 2018.